The Center for Medicare and Medicaid Services (CMS) recently updated their Overall Star Ratings. Released on December 21, 2017, the update changed the rating of nearly half of US hospitals. The changed methodology resulted in a “flattening” in the distribution of ratings (from one to five stars). The previous system produced a rough bell curve, with nearly two-thirds of hospitals rated a “3” and only a handful scoring a “4” or “5.” Under the new model, over 72% of hospitals earned a “3” or better, with more than half of those achieving a “4” or “5”. The number of “1” and “2” ratings stayed relatively constant, dropping from 29% to roughly 27.5%. These updates will likely please hospital leaders, who have expressed concerns about the rating system since its mid-2016 initial release: How are these star ratings determined? Do they represent a fair assessment of hospital performance? How can hospitals improve their ratings? 1. CMS Hospital Compare collects over 100 measures of data from hospitals. 2. 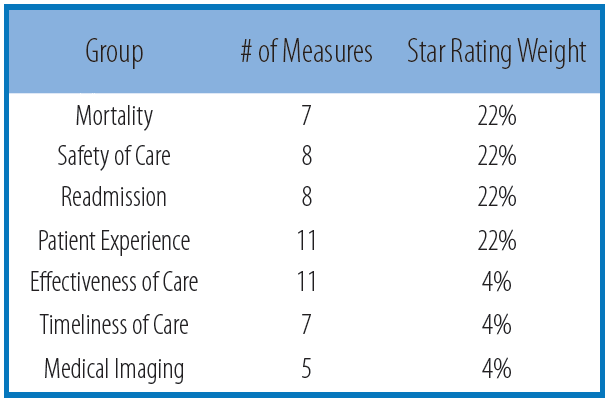 57 of these measures are used to determine a hospital’s star rating. Why not all 100+? Some are duplicative, some apply to only a small number of hospitals, and others were considered relevant when collected but no longer apply. 4. Each category is scored, weighted, and combined to create a Summary Score. Not every hospital reports enough data to generate a score in all seven categories. When that’s the case, categories they do report on are weighted heavier to make up the difference. 5. A statistical clustering algorithm called k-means clustering analysis is used to divide the Summary Scores of hospitals nationwide into five groupings “in a way that minimizes the distance between summary scores and their assigned category mean.” In other words, the algorithm calculates the “average” score in each category, then assigns each individual hospital to whichever category their score most closely resembles. 6. CMS assigns the hospital a rating from one to five stars based on the hospital’s summary score grouping. Not every hospital evaluated has sufficient data/interactions to submit a score for each of the 57 measures. CMS has to adjust the weight of the measures for which a hospital can supply data to account for any missing categories. In some cases, hospitals which report on fewer individual measures seem to benefit from doing so.